Welcome to this magnificent penthouse in a highly desirable part of Santa Catalina. This penthouse of 110 m² is divided into two bedrooms, two bathrooms, a walk-in closet. There is also a large terrace of 25 m². When you come home to this bright and wonderfully renovated residence, you will be greeted by open spaces and panoramic windows with stunning views. There is light parquet flooring throughout, bathrooms with Mallorcan natural stone walls and built-in bathroom furniture, fitted wardrobes, and a white kitchen with Siemens white goods. 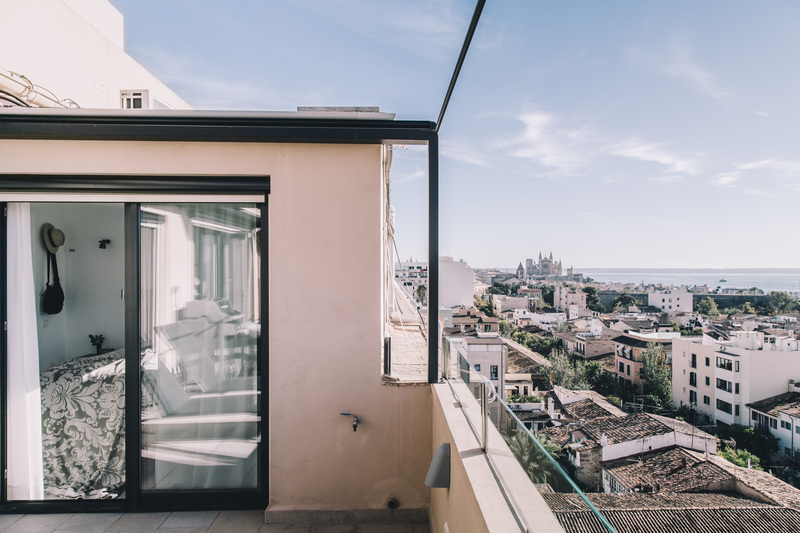 The spacious terrace enjoys magical views over Palma city, the sea and the harbor, and has an outdoor shower, a large barbecue and plenty of room for dining and socialising. If you are looking for something unique and magical, this wonderful penthouse is just perfect for you! Restaurants including Patron Lunares, Duke and La Perla are just around the corner, and you will also have a choice of friendly local cafés, bars and the gastronomic market on your doorstep. And if you like to play tennis, work out, swim or just relax and enjoy lunch with friends, the Palma Tennis Club is a stone's throw away.